After a strong start to 2016 prices lost some of their lustre. Brexit had been a strong catalyst for the spike in demand. Gold-price volatility also increased leading into the US presidential election in early November. After it became apparent Donald Trump pulled off a surprise win, gold spiked up more than $60 per ounce in international trading during the night of the US election, but gave back the entire move as US markets opened. After the election, gold sold off as investors rotated to sectors that were viewed to be greater direct beneficiaries of a Republican-controlled House and Senate under President-elect Trump. The price of gold sat at around $1,184 an ounce at the end of 2016, or just over 11% higher than where it started the year. In early January, many investors began pouring their money into assets that are traditionally perceived as “safe havens,” which includes gold. Gold tends to attract investor attention as a store of value when markets are in turmoil because it typically has a low correlation with other asset classes and a long history as a financial instrument. Gold prices also have been buoyed by historically low interest rates in many parts of the world. Low interest rates reduce the opportunity cost of holding physical gold. Although gold does not pay a yield and often has costs associated with storage, in a negative-rate world, more investors have turned to gold as an alternative to government bonds. Gold offers reasonable liquidity while not being tied to any one region, financial system or government. 2017 sees elections around the world also could influence the price of gold, as was evidenced by the short-lived spike that occurred after initial results indicated Donald Trump had won the US presidential race. One of the key drivers for gold is uncertainty. While all elections bring change, given the US results this year and subsequent market reaction, upcoming elections in Europe and elsewhere seem to have the potential for more upheaval than most. A further increase in US inflation also could boost gold prices, as some consider gold an inflationary hedge. This year, prices have responded to anticipation surrounding potential US monetary policy actions, selling off when the Federal Reserve (Fed) seemed to be moving in advance of inflation and rising when the Fed appeared to be willing to be behind the inflation curve. I should mention that gold prices are very difficult to predict, and their correlation with interest rates is not clear. The greatest short-term price swings have typically resulted from events the market wasn’t fully expecting, such as the United Kingdom’s Brexit vote in June. Like most commodities, ultimately, fundamental supply and demand drive gold prices. Last year, increased investor demand for gold has dramatically tightened the supply-and-demand balance. Mine supply is historically slow to respond to higher prices; five weak years for gold equities left companies with overextended balance sheets and frustrated investors—the five-year cumulative return for the industry from 2010 to 2015 was -76.2%.4 Mining companies appear to have significantly underinvested to the point that even with a large increase in spending. It is difficult to see how gold production could be higher than current levels in five years’ time; it often takes 10–15 years to ramp up from an initial discovery, through feasibility studies, permitting and construction to a producing mine. The five-year slump in gold equities forced discipline on an industry that had not historically needed to deliver on traditional financial returns. It appears to us that the gold-mining industry is emerging from the downturn more focused on real capital returns and free cash generation than we have ever seen before. The downturn in gold forced companies to cut costs and reduce spending. In our view, gold miners have done an excellent job so far this year controlling costs and maintaining financial discipline into the rising gold price, and we have seen a material improvement in cash flow and earnings as a result. Looking ahead, however, it may be difficult for companies to maintain these cost controls, especially if overall economic activity continues to increase, which typically places upward pressure on energy prices. The gold-mining industry has benefited in recent years from low oil prices, as moving and crushing large quantities of rock to extract gold is very energy intensive, and any substantial increase in oil prices could crimp companies’ operating margins. Weak currencies in some heavy mining jurisdictions such as South Africa, Australia and Canada have also helped reduce costs over the last few years, but many of these commodity-linked currencies have strengthened recently, which will likely make the year-over-year comparisons in 2016’s fourth quarter more challenging. We are finding attractive investment opportunities in the gold industry, with many companies still trading at values below what it would cost to build their existing mines today. It is important to keep in mind that this industry is among the most volatile. Even after this year’s rally, the price of gold remains more than 50% below year-end 2010 levels. An investment in the gold industry is based, in part, on the fundamental belief that exogenous events such as Brexit, rising trade tensions, inflationary fiscal and monetary policies by many central banks globally should support gold prices. If gold prices rise, new opportunities emerge for mines that did not make sense at lower gold prices, as lower-grade resources become economic and the cost of capital for new plant and equipment falls. Additionally, stronger cash flow provides the ability to pay down debt faster than expected and to chase new mineral exploration or incremental plant expansions. 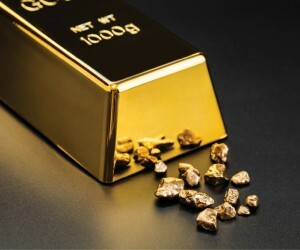 Furthermore, mining companies have continued to focus on improving the cost structure of their operations, debt repayment and asset rationalisation, which we believe should result in improved performance potential and is conducive to equity-price appreciation, especially in a rising gold-price environment. In our view, the combination of high volatility and low correlation to the overall market make gold stocks an attractive potential diversifier to consider as part of an overall portfolio.